Sounds crazy. 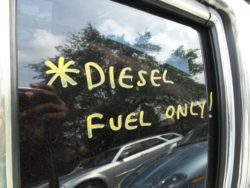 But that’s what it boils down to when you’re searching for a used car. You don’t know them and you don’t know ‘it’. The car could be a rolling masterpiece with a maintenance history a mile long and an owner who worshiped that hunk of metal. Or, it could be a rolling deathtrap that’s worth more dead than alive. Many people prefer to buy from a used car dealership or just a car dealership, in general, have motor trade insurance like i4mt to cover themselves if something goes wrong. In my work as an auto auctioneer and remarketing manager, I have seen cars Frankensteined with third-rate welds and maintenance done exclusively to get someone to sign on the dotted line and nothing more. I have also seen old jalopies that still had another 7 to 10 years to go, even if that car was first built way back in the 1990s. 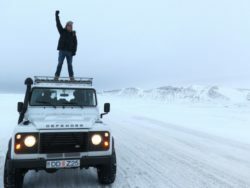 Condition means everything when you buy a car, as of course, you going to need to insure it at somewhere like https://www.moneyexpert.com/car-insurance/ afterwards. So how can you figure it out? You have two options. The first is to buy from the owner. Some folks will tell you the truth, the whole truth, and nothing but the truth. But often times, you are dealing with someone who is trying to sell that car for a reason they don’t want to fully disclose. It could be a transmission that’s on it’s way out, or that the car had been recently wrapped around a telephone pole and repaired to the point where it can almost drive straight. In the real world it usually takes more than a fair bit of time to buy from owners because until you get the vehicle professionally inspected, you can only know so much. Remember that some people actually buy cars into to have them repaired at auto repair shops Greensboro and try to sell them on for a profit! The second is to buy a car from someone who has a certain level of experience with buying, selling and inspecting vehicles. When you buy from a dealer, or any professional in the automotive field, you are influenced by their direct knowledge of that product. Some folks are only out there to sell. While others will give you the entire history along with the strong and weak points of that specific vehicle. Don’t believe you can’t be swayed because most professional car sellers rely on their powers of persuasion to make a living. I’m one of those later people. 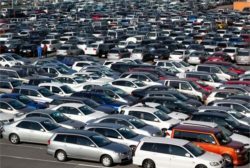 I started off on the auctioneering side of the wholesale side of the car business – typically liquidating anywhere from 200 to 300 cars per auction. It’s not as hard as it sounds to simply say “habada-give- FIFTY-five-hundred dollar bid now six”, for two to three hours a day and offer the most basic of product knowledge to your audience “Run number 13 is an oh-five Ford Taurus LX. Redder than a Georgia tomato! Let’s get the bidding started folks!”. When you’re selling to professional car buyers, as I did, you are already among experts. Many of whom look at cars as often as some of us look at our cell phones. Eventually I switched sides to get the money I needed for my MBA at Duke and became a remarketing manager for Capital One Auto Finance. My job was to inspect, appraise and liquidate about 200 vehicles a week and I did this all over the USA – from Sacramento to Buffalo. For several years all I did was look at cars and determine their wholesale value. My scenery went from dirt cheap beaters to high-end exotics. From Lamborghinis that brought all the money in the world. to clapped-out Daewoos that were the rolling embodiment of junk. I gradually learned from those who knew more than me in specific areas of the car business such as auto repair, detailing, and body work. Like any good aspiring entrepreneur, I started to use my own savings to buy and sell the product that took up most of my daily work. It was a great time to do it. This back when Ebay had become the 800-pound gorilla of retailing used cars and Craigslist was mostly populated by educated professionals. You didn’t have to deal with a hurricane of competition, but you did have to be patient and precise when it came to buying cars. 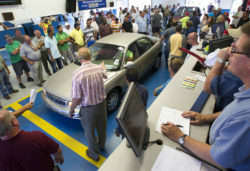 Every Monday morning I would go to a Carmax wholesale auction where trade-ins were sold on a weekly basis. 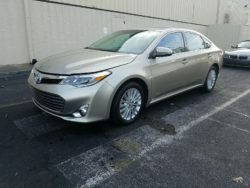 I spent most of my Sunday evenings figuring out what I would buy based on the Carfax histories and my own personal inspections of the vehicles which I highlight here. Out of about twenty cars in an auction that would typically have 130 vehicles, only four or five would make the grade. By filtering out those cars that were potential money pits and taking a deeper look at those that represented genuine buying opportunities, I gradually became better at the craft. But there was one day in particular that represented a true crossing of the rubicon – from emerging amateur to steadfast professional. One Monday morning I bought three cars. Nothing unusual for me at that point in my career, except for what I bought. A Subaru Impreza, as uninspiring as the one above, with the white paint completely stripped off so that all you saw was primer. 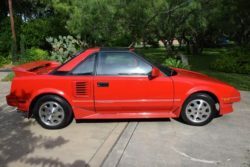 A 1st generation Toyota MR2 in red with the then fashionable 1980s t-tops that also had an undiagnosed engine issue, and finally, a two year old high-end luxury car. An Infiniti Q45 with all the options. 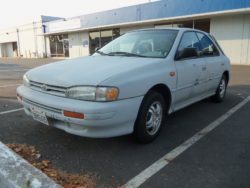 I paid $25 for the Impreza since nobody else wanted it (the car wouldn’t start). $225 for the Toyota MR-2. As for the late model luxury car? I stole it. Thanks to a lazy person leaving a enormous pile of old wires and components from a recent repair job inside the trunk, I ended up getting the Infiniti for nearly $5000 below its rough wholesale value. The Subaru turned out to be an easy fix. I fixed the shift lock override so that it would easily shift from park to drive. 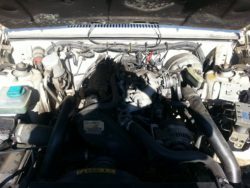 I then replaced the battery which back then was only around $35, Finally I put it on Ebay where a detailed description of its prior maintenance history along with its current condition yielded exactly $1576. A Rally Coordinator for Subaru flew all the way to Atlanta and then drove it back to California. That car lasted at least another 50,000 miles according to the Carfax history which I revisited every once in a blue moon. It was the perfect deal. He was happy. I was very happy. The Toyota MR2 ended up needing a fuel pump. The low-miles (114k) and lack of rust on a thin-framed sports car made it a perfect fit for a buyer who drove all the way from Michigan to pick it up. That fellow who was about as nice as Mr. Rogers, also moved his sister along with her belongings back from South Atlanta. He hitched the MR2 on a Uhaul dolly and off he want. The total price in the then strange and almost incoherent Ebay bidding process $2714. Finally came the two-year old Infiniti Q45. A car that was nearly $60,000 when brand new and had received critical acclaim from a long list of automotive magazines like Car & Driver and Motor Trend. It was the deal of a lifetime. 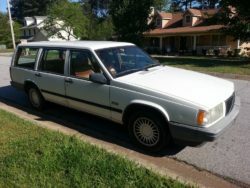 I had been scared as hell to bid on it at Carmax since I had never spent so much money on anything else in my life. Even the down payment for my home turned out to be less than the $23,600 I ended up bidding along with a $300 auction fee. For a guy in his 20s, this was a heart-palpitating experience and it took me an hour to calm down enough to get behind the wheel and start crafting my clever plan to turn this automotive money vault into money in the bank. I found the best detailer in Atlanta. A guy who did all the high-end vehicles, and owned every single piece of cleaning and deodorizing machinery I could imagine. Not even an army of cigar holes and battery acid on the carpet could keep this guy from making a hooptie look like a holy roller. While he finished making the Infiniti look better than new I scoped out a piece of local scenery that had the greenest greenery and enough shade to make the pictures pop in the minds of my audience. I then gave my Ebay visitors a guided tour of the car from beginning to end and wrote a description that I’m sure is stored away in the Ebay archives for its ability to make this car as lustfully alluring as possible. Did I mention my dealer insurance didn’t cover the car if I wrecked it? 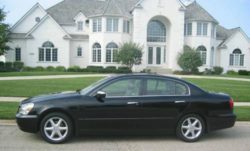 As soon as the Infiniti Q45 was listed on Ebay, I stored it in my garage and kept the key in a safe deposit box. 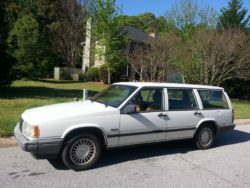 I was excited, scared, and as the car hit just $21,000 with only a day to go in the bidding, stressed to the point of being nearly physically ill. I answered about a dozen questions on the final day ranging from basic specs to detailed maintenance records and waited for that single brutal moment of free-market based truth. With a half-hour to go I finally broke even at $24,200. Then it went to 25-26-27… and with one minute to go it crested over $30,000. I decided to give my dogs an impromptu walk and wait for the final number. When I came back, my eyebrows almost flew right off my head. Thirty-two thousand five hundred dollars. I was rich! It takes a lot to get me to jump, but selling that car was like winning the World Series. I finally slammed the big pitch out of the park and hit two more home runs as well. One auction yielded over $10,000 in profit and I was hooked. From that point forward I became a professional car buyer and seller. A car dealer with no apologies for the way I made my living. Even though I was still working my daytime job, I spent every free moment possible and explored every opportunity to buy and sell cars. Carmax auctions. Local impound lots. New car dealerships. I would even go to a hotel that served as a transient crack house just to buy an old Cadillac that I knew could become rolling gold with the right care and attention. I eventually owned an operated an auto auction, sold that, and finally became my own banker. In a community filled with title pawns, check cashing rip-off artists, and legalized parasites of the financial world, I have chosen to become the George Bailey of my community and make folks owners of their cars instead of perpetual debtors. If a person is better off keeping what they got, I not only tell them but spend a healthy amount of time showing them where and how they can make their daily driver last. The work here at Dashboard-Light is one of my favorite ingredients in that unique recipe of keeping my business successful and my conscience clear. Today I have a successful dealership that focuses on cash deals, and I also operate a site called 48 Hours And A Used Car that helps folks buy cars that are 2012 and newer. For a guy with Masters degrees from Emory and Duke, I have chosen an incredibly strange way to make a living. But it brings me joy and challenges my mind along with my body which, whether I like it or not, now endures five to six miles of walking three times a week at the local auto auctions. Some of the strangers we meet in our life’s journey are unfamiliar friends who just need a little bit of help. When it comes to this long-term quality project, I hope you find the exact help you need. Feel free to contact me here or at steven.lang@alumni.duke.edu if you would like any unique help with your deeper dive.